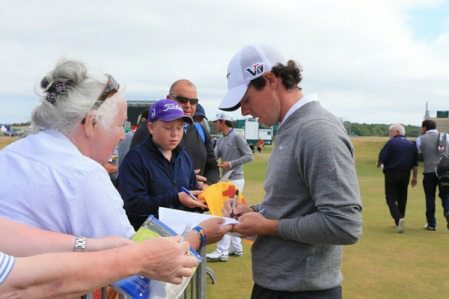 Rory McIlroy opened his Open account with a 69, then insisted he has no intention of conforming just to keep people happy. After slamming Olympic golf and drug testing in tour in his pre-tournament press conference, the Holywood star insisted he has no intention of asking for a media mulligan. As Shane Lowry crashed to a 78 and confessed that he was so mortified by his bad play that he “just wanted the ground to open up and swallow me”, McIlroy is clearly more than comfortable in his own skin. Asked if he regretted any of Tuesday’s explosive press conference, he said he only wishes he’d explained himself better when he said that “growing the game” was not a priority for him. Having said he got into golf only “to win tournaments", he said: “Obviously I feel like I do my bit to grow the game. It’s not as if I'm uninterested. “I feel like golf is a great vehicle to instil values in kids. I'm an ambassador for the PGA Junior League, I do some stuff for the First Tee in the States, and I feel like I've used my success in golf in a very positive way in the community. When asked if he was still happy that he said he would watch only “the sports that matter” in the Olympics — not golf — he was not for changing. “Yeah, I still don't think I'm the only one,” he said. “Look, it's my opinion. I think my opinion's shared by a few people, but some people may think it's wrong and that's fine. Pádraig Harrington said that McIlroy’s comments on Tuesday were those “of a young man” and he’d change his tune in 20 years. Bt that as it may, the 27 year old is off to a good start in his bid for major No 5. Just six shots behind Phil Mickelson after a solid 69, he said: “It was good. I think if I had stepped on the first tee and someone had given me a 69, I probably would have taken it. McIlroy got off to a slow start, then birdied four holes in a five hole stretch from the fourth to gran the lead. He was frustrated he double bogeyed the 13th by flying the green and then three putting, he was pleased he came back from another soft bogey at the 14th with a birdie at the 15th. He said: “I knew today was a day where you had to make the most of the conditions because I don't think we're going to see the course like this for the rest of the week. The American, 43, lipped out for the record from 18 feet on the last, becoming the 28th player to shoot a 63 in a major. He has a three stroke lead over Patrick Reed and Martin Kaymer on eight under par — and six shots on Rory McIlroy. But he could not believe his bad luck as his putt veered right at the end and lipped out. Mickelson said: “Nothing will match that final round at Muirfield, but it was one of the best rounds I've ever played and I was able to take advantage of these conditions, and yet I want to shed a tear right now. "That putt on 18 was an opportunity to do something historical. I knew it, and with a foot to go I thought I had done it.